I kind of feel like though they definitely were not the stars of this show, they may have definitely, specifically been invited to witness, for some important reason. Maybe just to share the joy. And that maybe the shepherds are all of us, invited to come and see. 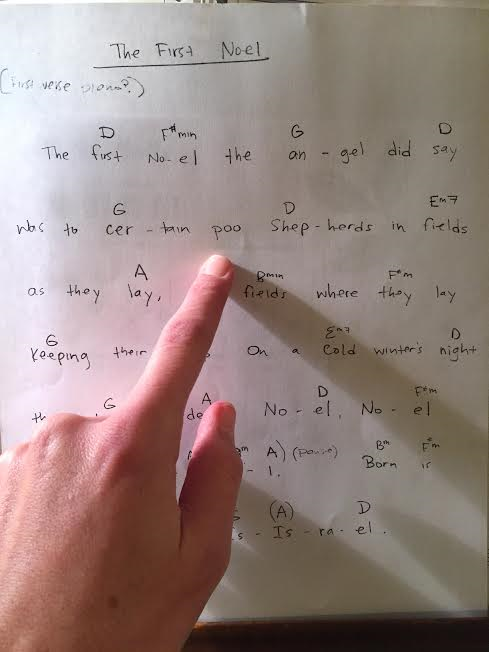 When I was a kid I thought there were no carols for the shepherd, so I wrote one. I can aaaalmost think of the title. Give me a second. Dang, I can't remember. But if I know me, it was likely something extremely clever like The Shepherd's Song. Lately I've been doing a lot of music for the Christmas season. I accompanied some ladies singing, then played a piano solo of Silent Night that really is a vocal solo so I roped my friend into singing it for me at the very last second. And when she started into the third verse and proceeded to forget the words and then HUM the melody (whereupon I was dying behind the piano), I just thought, this. This is what it's all about. It was pretty funny at the time, considering the ragtag way it was all thrown together. I had also just done a reading and was wearing a headscarf that kept falling down over my eyes whilst playing. For a party at church, a woman in charge asked me and Sean to do a song. It would be for the shepherds portion of the nativity and she gave me some options. I happily selected The First Noel because I've always loved it but have never quite figured out what to do with it. Apparently what it needed was some acoustic guitar and to be jazzed up a bit because the song and I finally found our stride. I fiddled with it and worked out a simple arrangement. Sean is not so eager to perform and needs to be reminded to not hide his talents under a bushel. But I love to play with him. I try to keep my overbearance to a minimum and he conceded. I wrote out the chords for him and we practiced and practiced and, as usual, the best part is always in the prep and practice, though the performance went swimmingly. And I just loved doing it. I hope it becomes a tradition. Here's the "music" I wrote out for us. Many edits were made throughout as we fixed mistakes and rehearsed and fine-tuned, but one edit was never made, for I wouldn't allow it. As he does, Sean first brought it to my attention by quietly walking up and just pointing. Too good. Just too good.